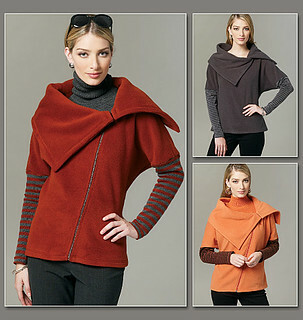 I originally purchased Katherine Tilton’s 2011 Vogue pattern with the intent of using some of my thicker fleece but when I pulled it out this week and read whistlin dixie’s review and her blog post about the clinginess factor I was hesitant. I am making toppers I can throw on to go take a dog walk or get the mail or check the garden without showing my buns in my Winter Uniform: leggings. I used an ancient woven wool lycra for my first version of this topper. I might make it again in a boiled wool and remove some width and length. 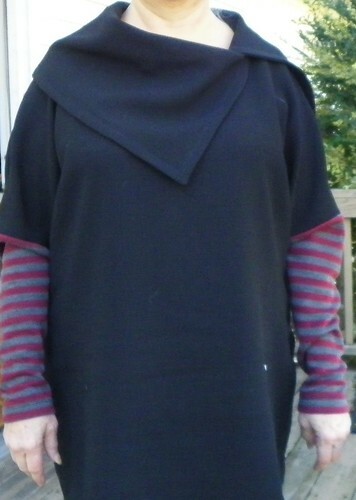 I hadn’t noticed the funky mess where the topper fabric meets the lower sleeve fabric until I uploaded this pictures. Wonder if I should try to fix it or just leave it as is. I think I’ll leave it alone and move on. I have a lot to sew up before I have to return to the spring, summer and fall food garden madness. 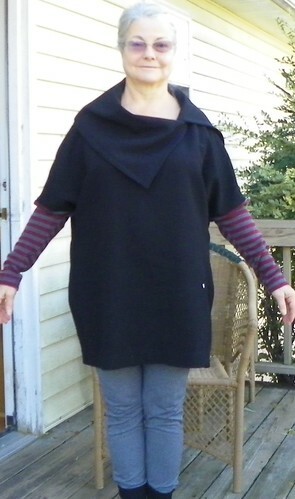 I’m off to make a turtleneck out of the sleeve fabric to wear under this top. I am so glad to see you again! I was just thinking about you recently. Your hair is long and of course–it is beautiful as always. Your top is perfect and looks terrific. Don’t stay away so long. Hey Gwen, I’ve been thinking of you lately. Hope your holidays are wonderful! Love this top Looks great on you!! What a talent! Oh I quite like this vest/top. Wonder how it would look in boiled wool! Mary Beth, this is so funny. After I’d written the comment above, I scrolled down to see what fabric you had used. There was your comment on boiled wool!!! How interesting!